I coach our boys’ football, baseball, basketball and soccer teams. It’s the highlight of my day to be on a field running around with the neighborhood kids. They all enjoy learning to throw spiral passes, catch pop flies and kick goals, but they really, really enjoy getting dirty. They’ll dive for fly balls 10 feet from their gloves and slide into second when the play’s at third…all with the hope of getting dirty. Dirt’s a badge of honor when you’re a kid. So why would the dinner table be any different? Messy meals are popular in our house and Sloppy Joes are the perfect messy meal. They’re a saucy concoction of ground meat and vegetables perched precariously between a top and bottom bun. We spike our Joes with onions, tomatoes and fresh herbs, depending on our mood. The spikes add flavor and nutrients, and help develop their palates. We want our kids to be adventurous, well-balanced eaters as adults so we’re training them when they’re kids. Marilyn and I plan for the expected mess of Sloppy Joes with extra napkins and a “placemat” of newspaper to catch runaway meat and sauce. Sometimes the boys even wear aprons, which help keep their jerseys clean. Heat a large skillet over medium high heat. When it’s hot, add crumbles of ground beef evenly across the bottom of the skillet – do this in two batches if you need to. Allow the meat to cook for 5 minutes before stirring. Continue cooking the meat until the juices cook away and no red pieces remain. Transfer cooked meat to a paper towel-lined plate to drain. In the same skillet over medium heat, add the olive oil, onions and tomatoes. Cook until soft. Add the garlic and basil and cook another 2 minutes. Add the meat back to the skillet. Add the ketchup and mustard and stir to combine. Season with salt and pepper and serve on toasted hamburger buns. Mix some barbecue, enchilada or hoisin sauce into the ketchup for a different flavor. Use the lowest-fat ground beef you can find and make sure to cook it well done. Ground turkey and chicken are great alternatives to beef. Cook the meat on high enough heat without stirring so it gets golden brown. Add grated Cheddar, red onions and pickle wedges to the sandwich for more flavor and crunch. We don’t mind when the boys get messy or dirty; it just means they’re being kids. By the way, a little dirt is good for dad too! And remember…the messier, the better. Have a GREAT (and Messy) day!!! Always a challenge! Thanks Susie. What a delicious way to get messy. I love the recipe and hope I can try it. The Sloppy Joes we prepared at my schools were more mixes and quickies but the children loved them. They were served with lots of wet paper towels. Anything between a bun. I loved your idea to toast the buns. My Father always ate on a newspaper. It drove my Mother crazy. I think he read some of them but mostly he didn't want to dirty the table cloth. Enjoy the messiness. It usually comes with something good. What a great story, Patsy. Thanks for sharing! Love love love this post Andrew! I just saw it this evening after we finally finished off cooking, (and eating) your recent meatball recipe. Straight after soccer practice as it happens. While the plates were clean as a whistle the three happy little faces looking back at us were not. A good sign. 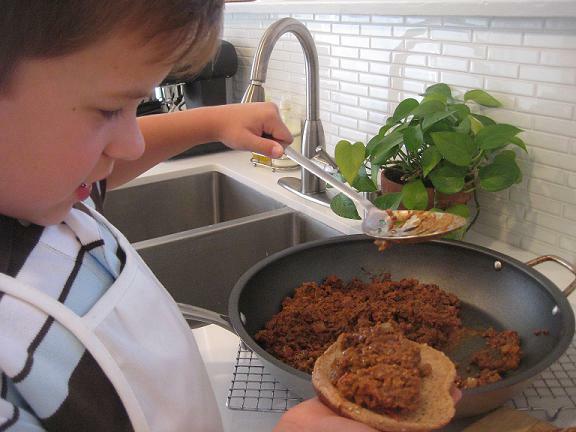 Our kids are huge fans of Sloppy Joes... so we'll be trying this recipe really soon too.